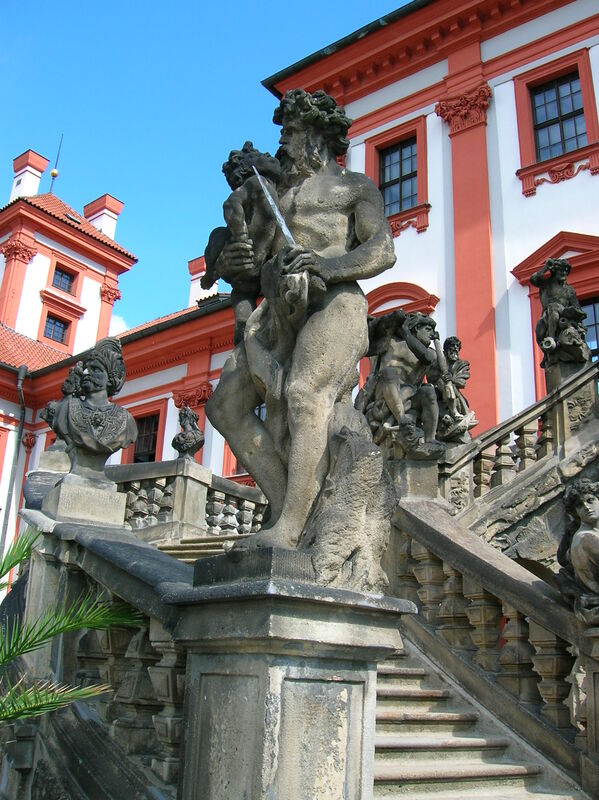 One of my favorite places in Prague is Trója Chateau, located across from the zoo in the Trója district. 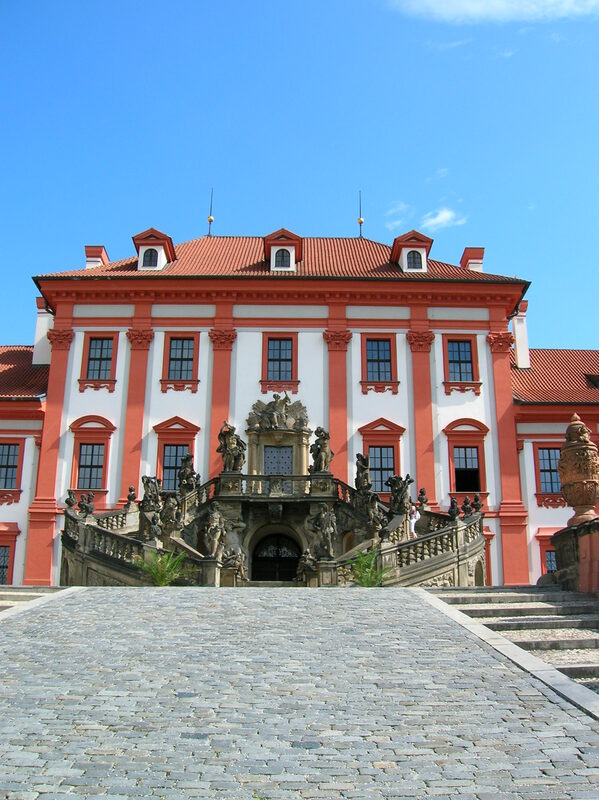 Built in Baroque style for Václav Vojtěch from Šternberk and his family from 1679 to 1685, it boasts a unique, captivating exterior as well as a richly decorated interior. On this particular day I arrived at 10 am, but it was Friday, and a sign on the door informed me that the chateau did not open until one in the afternoon. As I peered at the Baroque gem, I recalled that some major historical figures had stayed here. 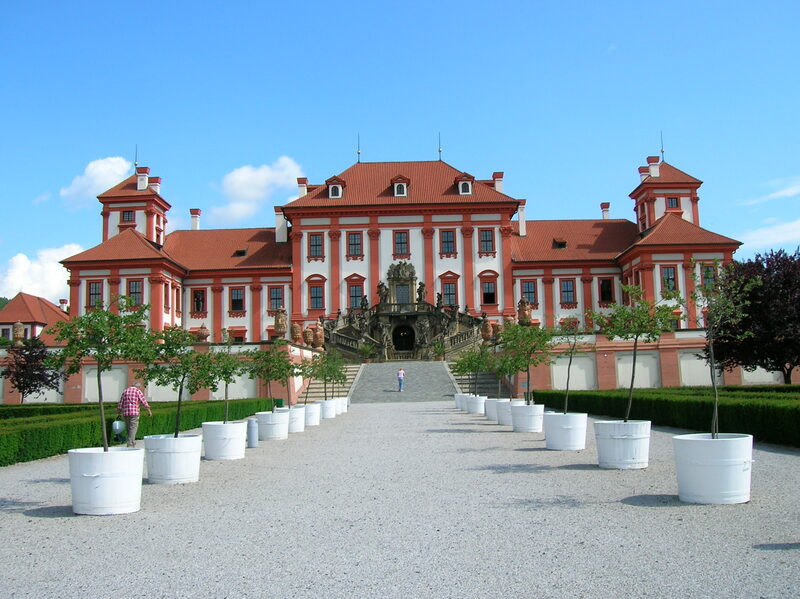 Empress Maria Theresa had owned the place for a while but only spent the night for short periods of time, and Czech historian František Palacký – one of my heroes – stayed here on several occasions. After spending time in the zoo watching monkeys swing from trees and polar bears wade in water, I had a leisurely lunch and returned to the chateau before 1 pm to take in its remarkable exterior and stroll through the incredible garden. 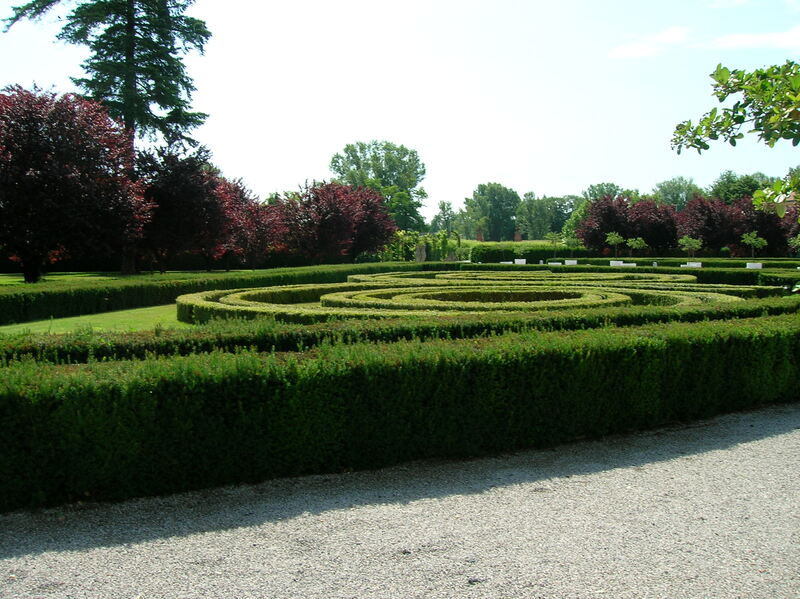 Inspired by the Roman villas he had seen during a stay in Italy, French architect Jean Baptiste Mathey designed the unconvential building with its main entrance facing the French garden. 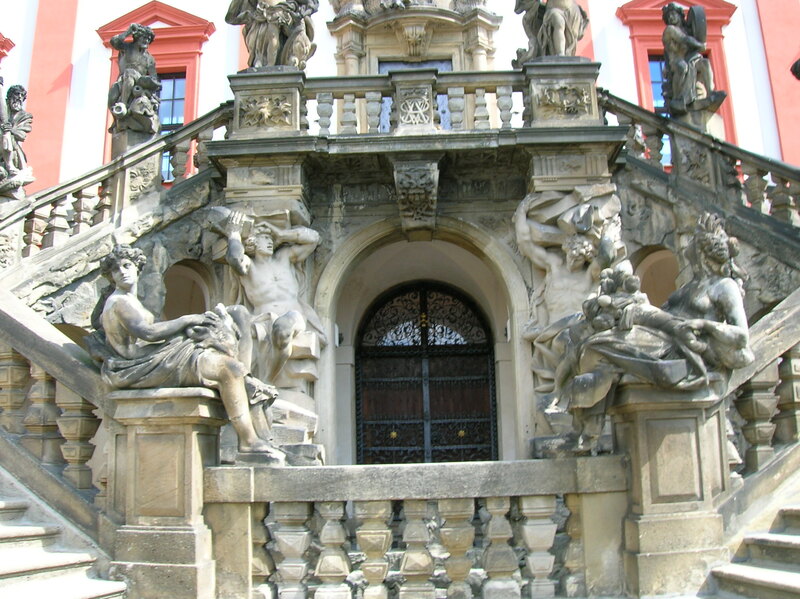 I loved the statue-flanked, two-sided staircase leading to the front doors. From the statuary created by George and Paul Heermann, I picked out the gods Hercules, Pallas Athena and Jupiter as the deities defeated the Titans. 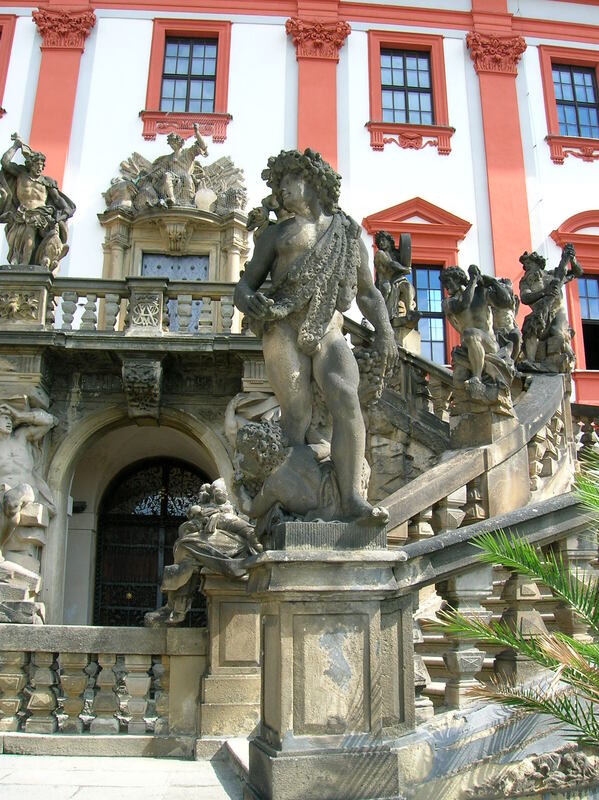 I also was enthralled with the pilasters that displayed stars symbolizing the Šternberk clan as well as the grapes and rabbit heads that decorated the ornate façade. In the garden I took note of the busts of emperors and the fountains. The large terracotta vases added an elegant touch to one of my all-time favorite gardens. 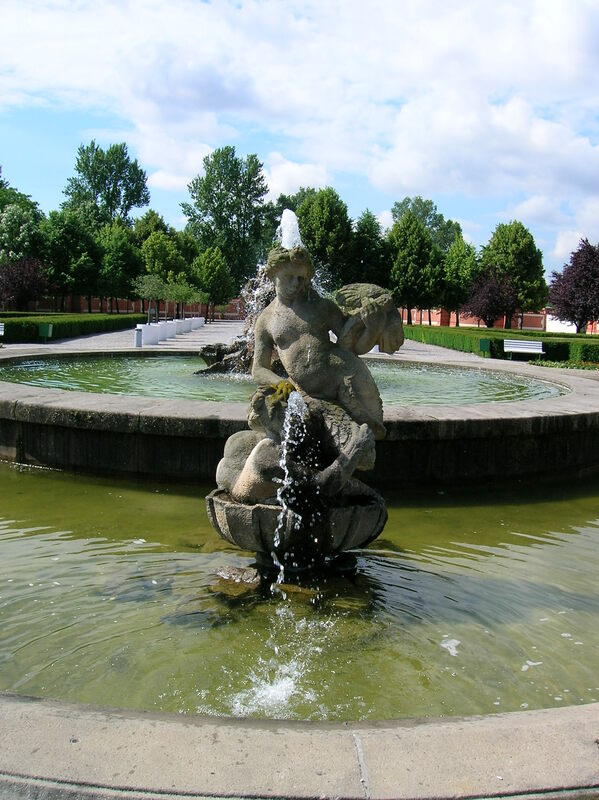 I photographed the fountain depicting Neptune with a dolphin at his feet. I wished I had no pressing engagements that day and had time to sit on a bench near the chateau and read for hours. When the chateau opened, a large group of more than 30 seniors marched through the entrance, and I had to wait for the second tour at 1:30 pm because the seniors had booked a tour in advance. I liked it better when you could walk through the rooms by yourself without a guide. I preferred to take my time and soak up the atmosphere of each room, reading the clear descriptions carefully and taking note of all the symbolism. I waited on a bench at the box office, noting that even this room was richly decorated with a frescoed ceiling of galloping, white horses pulling a golden chariot and a green and white tile stove. Soon it was time for my tour. As usual, the space that impressed me the most was the Habsburg Hall, where frescoes on the ceiling and walls have a Baroque tromp d’oeil effect, and painting pretends to be plastic with illusionary statues, reliefs and busts. I gazed at the swirling scenes on the ceiling that depicted the Christians’ victory over the Turks and almost became dizzy. It was too much to take in at one time. I noted that the golden triangle in the center stood for the Holy Trinity and saw the three theological virtues of Hope, Faith and Love take a trip on a cloud. When I looked at the western wall, I was immediately drawn to the defeated Turk flying through the air. I turned around, facing east, and took in the fresco of Justice celebrating victory over Injustice. Vice, Folly, Egoism and Avarice gathered around a fireplace, unsuccessful in their pursuits. I lifted my gaze and could hardly catch my breath as Holy Roman Emperor Conrad appeared with Albert Habsburg. I had read that the blood on Albert’s robe and the white color that is only under the belt inspired the Austrians to make red and white their flag colors. 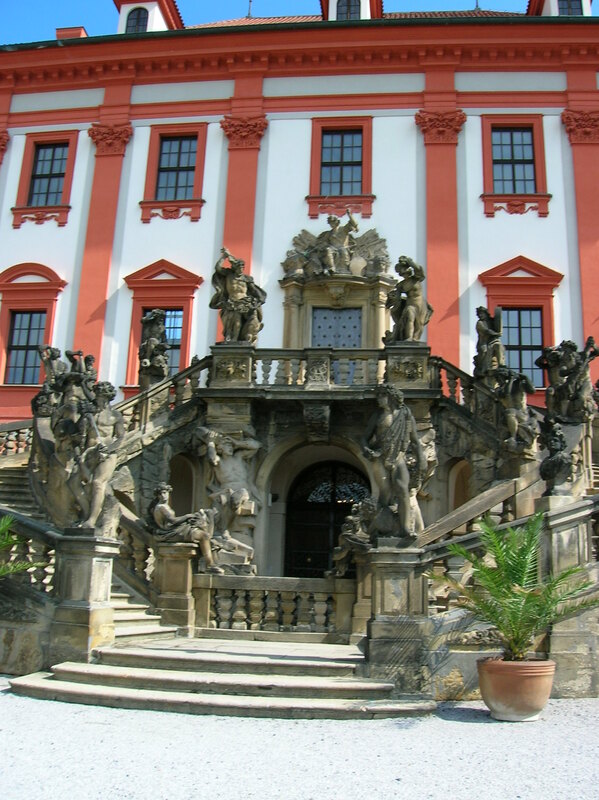 I had yet to absorb the scenes on the northern side, where a story focusing on Count Rudolf Habsburg, who later became emperor, played out. While hunting, he ran into a priest who was hurrying to the sick, and the count gave him a horse. The priest foresaw that Rudolf would one day be crowned emperor. Because I had visited so many castles and chateaus, I easily identified the very physically unappealing Holy Roman Emperor Leopold I with his long, dark mane of hair and ugly features. I tried to focus on each illusionary statue. I wanted to fully appreciate the reliefs of Habsburg emperors and Spanish kings, but my head was overflowing with too much visual information. My other favorite rooms were the three Chinese-decorated spaces, dominated by remarkable wall and ceiling frescoes. I noticed boats, a meandering river, bridges, a town in the background and a rocky landscape as well as Chinese people, exotic birds, curved roofs and palm trees. A bridge with black marble pillars caught my attention. I sensed that the gushing waterfall was about to tumble into me and took a step backward. I could not forget the chapel, which ties with the Chinese rooms for my second favorite space. The black Madonna always took my breath away. A crowned Virgin and Child were clad in clothing with golden swiggles, draped around them as if they were wrapped tightly in a blanket. I was especially entranced by the details of their curly hair on the original statue. I turned my attention to the large paintings of Christ’s last hours alive. The rendition of the crowning of Christ with thorns was especially moving. Another painting that spoke to me was Václav Špála’s “Plakánek Valley,” a vibrant mixture of greens and pinks, simple shapes that created a dynamic whole. In Jindřich Prucha’s “Under the Tree” a solitary woman, clad in blue, sat under a big tree, surrounded by lush, green scenery. The guide explained how the painting depicted the darkness of the days leading up to World War I, but I only saw loneliness and emptiness. The sense of solitude and the sense of the figure being swallowed up by the environment did not evoke darkness for me. On the contrary, the green scenery gave me a positive feeling. In Zdenka Braunerová’s “Landscape After the Rain Viewed from Tábor,” I was smitten by the dark skies looming over the two small cottages in the green landscape. I liked the works of Antonín Slavíček in the rooms as well. There are many intriguing ceiling and wall frescoes in the chateau. One that I particularly enjoyed looking at portrayed Bacchus, the god of wine, with putti flying around him as he chugged down wine. The other side showed the morning after the drunken escapade. The putti had to hold each other up, and Bacchus was carried on the shoulders of several figures. Finally, I left, wishing I had been allowed more time in each room. I knew that before long I would be back again to see one of the most captivating and underrated places in Prague.